Extraordinary cleaning power in one little pod. Unlike washing powder, Ariel 3in1 washing tablets has a unique multi-compartment design that keeps the ingredients stable and separate until they reach the wash, providing a super concentrated cleaning power. The innovative film of Ariel washing capsules dissolves completely in contact with water to release the powerful technologies that tackle a broad stain range providing you the best liquid detergent from Ariel, with just the right amount of detergent. Use together with Lenor fabric conditioners and Unstoppables for an extra boost of softness and freshness. 19 washes based on 1 capsule per wash.
Cleans, lifts stains and brightens. Extraordinary cleaning in one washing capsule. Easy to use: no need to measure and pour. Gives you brilliant results even under tough conditions. Outstanding cleaning even at 30°C. Ariel 3in1 Pods leaves your clothes looking and smelling brilliantly clean.Extraordinary cleaning power in one little pod. 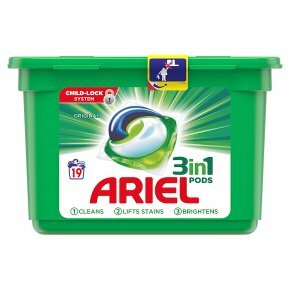 Ariel 3in1 Pods Original washing capsules have a unique multi-compartment design that keeps the ingredients stable and separate until they reach the wash, providing a super concentrated cleaning power. The innovative film of Ariel washing capsules dissolves completely in contact with water to release the powerful technologies that tackle a broad stain range with just the right amount of detergent. Use together with Lenor fabric conditioners and Unstoppables, in wash scent booster, for an extra boost of softness and freshness. Ariel 3in1 Pods leaves your clothes looking and smelling brilliantly clean so if you want to keep your whites bright, reach for Ariel laundry detergent. WARNING! This product may be harmful and could cause serious injuries. Keep Ariel pods out of reach of children. Visit www.keepcapsfromkids.eu for more information. 19 washes based on 1 capsule per wash. Biological Laundry Detergent. Danger. Causes serious eye damage. Causes skin irritation. Harmful to aquatic life with<br>long lasting effects. IF IN EYES: Rinse cautiously with water for several minutes. Remove contact lenses, if present and easy to do. Continue rinsing. IF ON SKIN: Take off immediately all contaminated clothing. Wash with plenty of water. IF SWALLOWED: rinse mouth. Do NOT induce vomiting. Immediately call a POISON CENTER/doctor. Dispose of<br>contents/container to an appropriate local waste system.